So how come nobody told me that Starbucks makes decaf Frappuccinos? 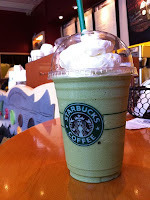 Frappuccinos are among my favorite drinks in the world. But for the past two years I've either been: (1) pregnant; (2) trying to get pregnant; or (3) nursing. So, caffeine intake has been severely limited. Tonight I entered a Starbucks near Times Square, and discovered the pleasures of a decaf Frappuccino. Excited, I bought one - tall, coffee flavored with whipped cream - and then proceeded to drink it rapidly while taking the subway home. The polite teenager sitting next to me watched me as I downed the whole thing in about 30 seconds. I got so excited, I sucked hard and sent whipped cream flying. Some hit his coat. "So sorry!" I exclaimed, wiping it off. "It's just that I got too excited..I just had a baby, and I haven't had one of these in two years." "No problem," he responded. "I could tell you were really into this drink." I'm enjoying life with the new little man, and still on maternity leave. It's sad that in the United States, employers are not required to give any maternity leave! But fortunately my employer is very generous. I've used up my leave but I'm currently on unpaid leave through the spring. Life with the new baby is good, but definitely hard. And I've struggled with a little bit of postpartum depression. To be expected. There have been many life changes. But little things have helped me get through the day - taking some time to meet friends, going outside for just a few minutes each day to get some sun, writing in my diary when I get a chance. And the little one just started smiling. That's made it all worth it!